This is Steve Sande for Apple World Today, and youâ€™re listening to the AWT News Update podcast for Wednesday, October 18th, 2017. This weekâ€™s sponsor is BeLight Software, developers of Live Home 3D. If youâ€™ve ever wanted to design your own home or create a virtual model of an existing home to see how improvements change its looks, then Live Home 3D is for you. The $29.99 app is powerful and easy to use, and you can get full information on Live Home 3D at this link. 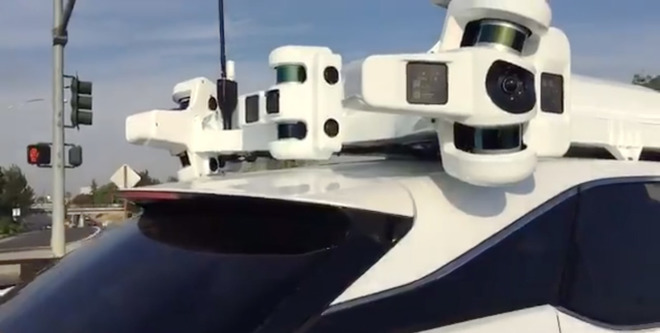 A short video clip appeared on Twitter today, purporting to show new test hardware installed atop one of the cars used for Appleâ€™s Project Titan self-driving car platform. The video came from MacCallister Higgins, who is the co-founder of a self-driving startup called Voyage. The new system isnâ€™t as cobbled together as the previous installation, but itâ€™s still rather ungainly. It includes a bunch of different cameras and radar units, in addition to six Velodyne LIDAR sensors, all neatly housed in white plastic to match the White Lexus itâ€™s installed on top of. Higgins believes that Appleâ€™s computing hardware is located in the roof-mounted unit, unlike other self-driving cars that move equipment into the trunks of vehicles. Apple is being highly secretive about Project Titan, and only this year revealed that it is doing research and development. Itâ€™s thought that Apple will be in partnership with another firm or firms to create a ride hailing business based on self-driving cars, and itâ€™s testing part of this technology on whatâ€™s called the PAIL â€” Palo Alto to Infinite Loop â€” shuttle. That shuttle would drive along a preset route, picking up Apple employees at shuttle stops and taking them to other Apple facilities. Appleâ€™s Chicago flagship store located on Michigan Avenue has a new ownerâ€¦but the store, which is set for its grand opening this Friday, will still be all Appleâ€™s to use. The store was sold to Walton Street Capital on October 4 which purchased the 35-story office tower and the plaza on which the Apple Store sits for $360 million from Zeller Realty Group. The store is notable for several reasons; itâ€™s in the classy Michigan Avenue shopping district, fronts the Chicago River, has a large outside plaza for concerts, and features all glass walls with a shiny roof resembling an Apple laptop. The store contains 20,000 square feet of retail space. Thatâ€™s all for today; Iâ€™ll be back tomorrow afternoon with another edition of the AWT News Update.